Photo By Jayson Mellom THROWN INTO THE FIRE Derek Johnson, SLO's newly appointed city manager, will have to steer the city through a $148-million unfunded pension liability issue. The impact is an $8.9-million per year reduction in the budget. Data Courtesy Of Calpers PAY THE PIPER Government agencies throughout SLO County, and the state, owe substantial sums of money to CalPERS over the coming 30 years. 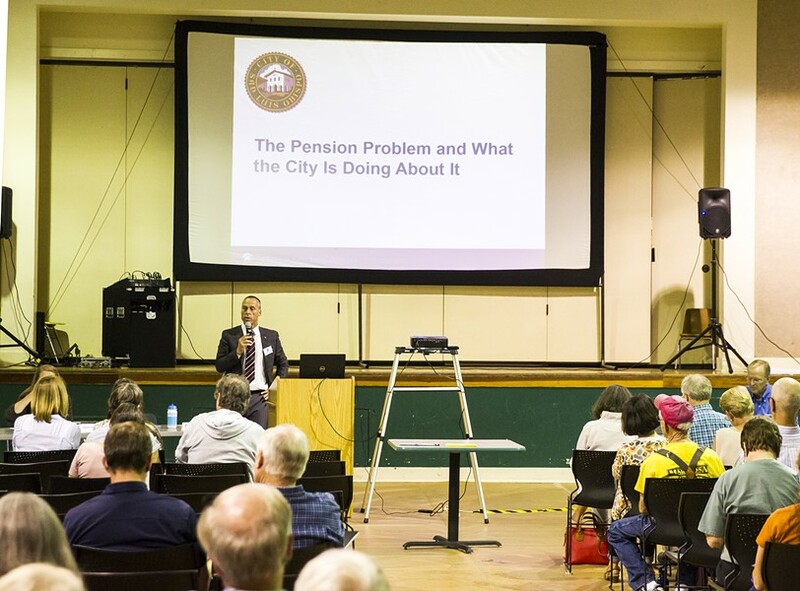 Photo By Jayson Mellom THE PENSION PROBLEM SLO city officials and residents convened for an informational meeting on Oct. 5 about SLO's pension obligations, which will skyrocket in the coming years. Photo Courtesy Of Calpers CULPRIT The California Public Employees' Retirement System, headquartered in Sacramento, is the largest pension fund in the U.S., serving 1.6 million government workers with $330 billion in assets. When city residents convene with government officials for a special public meeting, they're often loud—even rambunctious—with citizens seizing the chance to weigh in on a local issue. But on the evening of Oct. 5, the several dozen residents gathered at Ludwick Community Center were silent. Occasionally glancing down at the paperwork city staff handed out at the entrance, they quietly awaited the start of a presentation outlining a critical problem for San Luis Obispo. With SLO's newly appointed city manager, Derek Johnson, facing the audience, the title slide of a PowerPoint presentation shined bright on the overhead projector screen. "The Pension Problem," it read. The gist of that problem is simple but mind-boggling: SLO owes the state agency that administers its employees' pensions—the California Public Employees' Retirement System (CalPERS)—a sum of $148.4 million over 30 years to pay down unfunded liability, or pension money that's been promised but that the system doesn't have. Yes, $148.4 million. In addition to that, the city (and employees) will have to take on an increasingly larger share of local pension costs going forward—more than ever before—for current and future employees. SLO's final number-crunching says it will have to cut $8.9 million per year from its budget to stay solvent over time. The city's already taken certain measures, like instituting a hiring freeze, but more action will be necessary. "If we do nothing, by 2031-32, we'll be $80 million in the red," Johnson told citizens in Ludwick. "It's a significant issue. I would not underplay it. But we're not alone." And Johnson's right about that. While SLO has the worst pension problem of the local cities (ranked 23rd among all California cities in highest pension debt per capita, according to a Stanford University tracker), rising pension costs are impacting practically every governmental body in SLO County. More than 30 agencies in SLO County offer pension plans through CalPERS, the nation's biggest pension fund serving $1.6 million employees with roughly $330 billion in assets. The combined amount of local unfunded liability owed to CalPERS, as of 2016, is $336.8 million, according to CalPERS data. That sum doesn't include liability for teachers' pensions, administered by the California State Teachers' Retirement System (CalSTRS), and Cuesta College and Cal Poly staff and faculty; that data couldn't be tracked down by New Times before press time. But the impacts there are significant, according to school district officials. It also doesn't include the county employees' pensions, which are managed in an independent local fund. The unfunded liability in the county's system is $556 million—bringing the grand total to close to $1 billion locally. Public pensions weren't such a difficult problem to tackle until recently. The notion of providing retirement benefits, which for many public employees replaces Social Security, is a ubiquitous practice in California and throughout the U.S.—and has been for decades. But for a variety of reasons, the 21st century has been nothing short of disastrous for California's pension funds. Poor investment and policy decisions in Sacramento, coinciding with two major recessions in the same decade, have resulted in billions in losses with no reductions in cost. Taxpayers are saddled with the bill, which has driven a wedge between the private and government ecosystems and fueled cynicism, resentment, and misinformation among members of the public. "It's a push and pull between the public and private sectors," Erik Baskin, a longtime leader of the SLO City Firefighters' Union Local 3523, told New Times. "Up until [the Great Recession], you really didn't hear a whole lot of discussion coming from the private sector about our pensions. The private sector took [the recession] way harder than the public sector did, and pensions became a big issue." "It's bringing us to our knees," said Andrea Seastrand, a former U.S. congresswoman of the 22nd District and state Assembly member, and the president of the Central Coast Taxpayers' Association. The story behind the state pension crisis boils down to a brief yet consequential period of financial mismanagement by state officials and unions, according to several local stakeholders who've either spoken publicly about the issue or directly with New Times for this story. To hear Dan Buckshi, the former chief administrative officer and budget director for SLO County, tell it to the SLO County Board of Supervisors at a meeting in February, was like hearing someone recite the plot of a horror movie he'd gone over again and again. "I equate it to the five-year period of greed," Buckshi told the board. He's referring to the late 1990s—that's when the horror story began. At that point in time, CalPERS was "super-funded," meaning it had more than enough money to pay out the pensions it owed. Times were so flush that the union-backed agency pushed legislation signed by then-Gov. Gray Davis in 1999 that promised unprecedented increases in retirement benefits to state workers. "CalPERs really set the stage around the state in cahoots with public safety," Buckshi said. "CalPERS at that point was over 100 percent funded, the dot-com boom was occurring, money was pouring out of everywhere. Essentially, CalPERs started advertising that agencies could increase their benefits with absolutely no cost." SLO City Manager Johnson carried the plot forward: "[CalPERS] told local agencies, 'Hey you can upgrade your retirement plans, and it won't cost you anything. And, oh by the way, we're so super-funded that you don't have to pay anything this year.' It sounded good." When governments compete in the open market for employees—whether it's police officers, educators, planners, or administrators—they, over time, wind up offering the same benefits that another does to compete for quality workers. As such, the bumps in retirement formulas in the late 1990s that started at the top quickly trickled down to most counties and cities. "The biggest kicker was the benefits were granted retroactively," Buckshi said. "Somebody could've worked for 30 years under an old pension benefit, and if the next day they retire, they can retire as if they paid in [to the higher benefit] for the full 30 years." California came back down to earth pretty fast. Shortly after the new promises were made, the dot-com bubble burst, which put the first major dent in the pension funds. A few years later, the 2008 Great Recession hit and devastated them. "The largest pension fund in the world saw a 40 percent loss in its value," Johnson said. "Those investment losses—that pool of money—is ultimately what funded the promise to provide people a defined public benefit after they retire." In the fallout of the Great Recession, agencies scrambled to renegotiate lower pension benefits and more even cost sharing with their local unions. That happened sooner for some and later for others. By 2013, California had passed the Public Employees' Pension Reform Act (PEPRA), which mandated that lower pension formulas be used for all new hires. But the damage was done. While the reforms may have put the system onto a more sustainable course, it couldn't change what was already promised. CalPERS had lost so much money from the recessions, and had such high pension obligations going forward, that it couldn't "invest its way out of" the problem, according to Johnson. Even in a great stock market, the gap—the unfunded liability—was too big. "When you have double-digit gains on $300 billion instead of $500 billion, well, that's a big difference," Johnson said. "All of a sudden you have a smaller base to be working from." 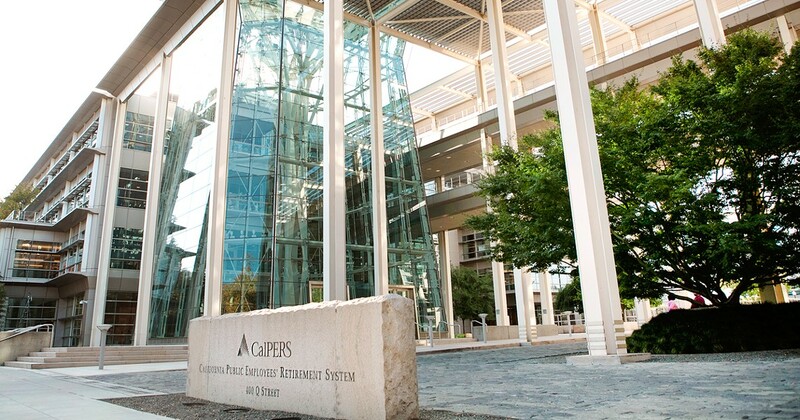 In 2016, the CalPERS board of trustees decided to begin lowering the expected return rate on investments, taking it down from 7.5 to 7 percent by 2020. Additionally, the latest lifespan expectancy calculations say that retirees are living longer. Those two factors have major ramifications for local agencies. It means localities have to take on a higher share of ongoing pension costs that were historically covered by the state. It's also a recognition that they'll be responsible for paying down unfunded liability accrued from the past. Johnson has a vivid metaphor for what the city of SLO is about to go through with pensions. "It's like, 'the snake's gotta eat the pig,'" Johnson said. "It's not going to be pretty watching the pig go through the body. But when it gets through the end, you'll be done." But it might actually be worse than that, as the pig will gain width as it's eaten. While SLO's pension costs were $7.8 million in 2014-15, they're projected to grow to $19 million by 2024-25. Johnson said the height of the payments will be around 2031. Those rising costs have to be offset, which, according to the city, means determining where to shave $8.9 million from the annual budget by 2020. The city's decided that $7.5 million will need to be cut from the general fund and $1.4 million from enterprise funds (water, sewer, etc.). The SLO City Council will start making those tough decisions at meetings in November and December. At that time, the council will give direction to the staff on exactly where to find the savings, and the city will eventually adopt a financial plan in April 2018 in preparation for the next year's budget. Johnson has brought forward a handful of methods to cut costs: Reducing services, asking employees for concessions, finding cost efficiencies in the organization, and exploring new or expanded fees and revenues. He said he won't be advising that the council raise utility rates to cover the shortfall. "This is one where we have to have a conversation with the community," he said. "We're having those tough conversations now." SLO isn't the only city talking about what funds to pull from the budget to pay off pension debt. The city of Paso Robles, which has the second highest local unfunded liability of $42.6 million, recently moved $5 million from general fund reserves to address it—using $2.5 million to pay down the unfunded liability and $2.5 million to establish a new pension trust that will ideally grow over time, city Administrative Services Director Marlaine Sanders told New Times. In contrast to the cities and districts contracting with CalPERS, the county of SLO is only one of two agencies in California (the other is San Francisco) that operates on a completely independent pension system, established in 1958. Because of that, the county's been able to undergo pension reform slightly ahead of and with more nimbleness than other local governments. The county negotiated lower retirement benefits for employee groups in 2010, ahead of the state's PEPRA, and lowered its market expectations ahead of schedule as well. With that said, because the county chose to increase its benefits along with everybody else in the early 2000s, its liabilities are only 69 percent funded, with a $556 million unfunded gap to make up. "Are we any smarter, better, or faster than [the cities]? No, not really," said Carl Nelson, chief investment officer of the SLO County Pension Trust. "But this system has kind of taken its bad news in pieces over the years." According to the acting chief administrative officer of the county, Guy Savage, pensions don't pose the immediate crisis to SLO County that they do for cities like SLO. "I can't give you the same kind of doom and gloom," Savage said. "We're not cutting services or positions because of pension issues. At the same token, we're not expanding our services as much as we could be otherwise." Local school districts are no less immune to The Pension Problem. School districts contract with both CalPERS and CalSTRS, and their pension costs are similarly rising. Ten-year budget forecasts for the San Luis Coastal Unified School District (SLCUSD) show annual pension costs doubling by 2025-26—from $7 million to $14.2 million. The increases coincide with the looming shutdown of Diablo Canyon nuclear power plant, which, when shuttered, will reduce annual property tax revenue by an even higher number: $8 million. 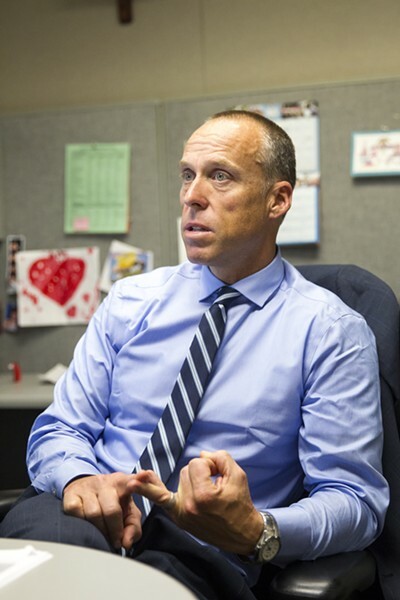 It's disturbing math, said SLCUSD Assistant Superintendent Ryan Pinkerton, that will inevitably lead to "reductions in personnel costs" in the district. "Eighty-five percent of our budget is spent on people, and we really can't go over that 85 percent," Pinkerton said. "We're going to have to cut that same amount of [pension] increases." The SLCUSD already shaved $2 million from its budget in 2017-18 in preparation for the Diablo Canyon shutdown. This fall, the district formed a Blue Ribbon Committee of community members that's in the process of developing a long-term plan to reduce costs and bring the district into financial sustainability. The rising pension costs will be one element of the conversation, Pinkerton said. "Because of Diablo, we've been focused on keeping our personnel costs in line," he said. "It's rough for employees because not only are they paying more [into the pension funds] but their benefit isn't really changing and [they won't get] a lot of raises." The money that's currently owed for the pensions of yesteryear will hurt the public employees of today. There's the direct, material effect of agencies slashing budgets and lowering benefits. The pension crisis is giving the next generation of teachers, firefighters, and police officers an uneven shake in security and benefits compared to their predecessors. And then there's the poor public perception. News headlines highlighting six-figure pensions for government workers, juxtaposed with the fact that fewer in the private sector are afforded a pension, have steered the conversation and stoked resentment. SLO City Manager Johnson said talk about lavish pensions is overblown, at least locally. According to SLO, the median annual pension for a city retiree is $44,400. Baskin from the SLO City Local Firefighters Union also pointed out that those who are making cushy retirement salaries are the small minority. "When people see in the paper that some government worker is retired and collecting $300,000 per year, that is the top .0001 percent of people who retire and somebody in a management position not a line-level employee," Baskin said. He said there's a misconception that employee unions are greedy. He noted that the increases in pensions promised more than 15 years ago had become the norm at the time. "When you look back at the things we were able to negotiate when times were good, those things were industry standards at the time, all over the state," Baskin said. "Even today, our focus when we're negotiating a labor contract has always been to be industry standard. We've never asked to be above anybody else." Nevertheless, the optics aren't good to taxpayer advocates like Seastrand, the former congresswoman and the president of the Central Coast Taxpayers' Association. "California is controlled by public unions. That's basically it," Seastrand said. "The forgotten taxpayer is going to have to be faced with it. They're going to have to pay for all this." Seastrand and Leslie Halls, the president of the SLO Business and Property Owners' Association, said they don't disagree philosophically with offering public pensions, but they do see the recent history of the issue as evidence that state lawmakers and union lobbyists can't be trusted by taxpayers.